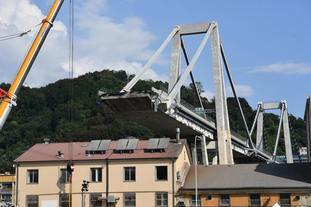 Three more bodies have been found in the rubble of the Genoa bridge collapse, raising the death toll to 41, according to Italian media. Genoa’s prefect’s office could not confirm the reports by the Ansa news agency and other Italian news media that the bodies were found by recovery workers overnight. Ansa said the bodies were found inside a car smashed under a huge block of concrete from the collapse on Tuesday. It said they were three family members, including a child, who had been travelling for a holiday when their car, with about 30 other vehicles, plunged when the bridge gave way. Two other people are believed to be still missing as recovery work continues.